With Easter just around the corner, we’re giving you the chance to win two tickets to one of the racing calendar’s biggest sporting and social occasions. We’re giving away two Bumper Bundle tickets for the Easter Monday programme at this year’s Fairyhouse Easter Festival. This includes admission, food and beverage vouchers, a racecard and a free €5 bet if you fancy a flutter at one of biggest events in Ireland’s racing calendar. Not to mention the fact that you can be there on the day to enjoy the excitement and the atmosphere of the BoyleSports Irish Grand National. The Fairyhouse Easter Festival, which takes place at the historical racecourse in Co Meath between Sunday, April 21, and Tuesday, April 23, is not just for seasoned racing enthusiasts. It’s known as the perfect family experience for a reason, with plenty of fun activities, great food, competitions and craic between races. At its core is one of the great races in Irish sport – the BoyleSports Irish Grand National. What’s so special about the BoyleSports Irish Grand National? The race, which takes place annually on Easter Monday, has a rich, storied history on this island. Some of the greatest horses in racing folklore have won the prestigious event, which is open to people from all walks of life. The Grand National is ‘the race of the people’ because small trainers and syndicates have as much chance as the racing royalty from the country’s biggest studs. 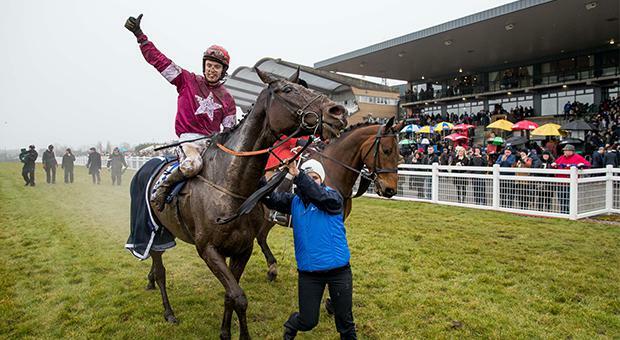 Runners and riders will battle it out for a massive €500,000 prize fund – €275,000 of which will go to the winner – and the right to join the likes of Arkle, Flying Bolt and Desert Orchid as historic winners of this illustrious race. What are the other big races I should look out for? On Easter Sunday, the Ryanair Gold Cup is a renowned Grade 1 race that attracts top class novice chasers from Ireland and the UK. Previous winners of this 2m 4f race include Arkle, Like a Butterfly and Road to Respect. Al Boum Photo, last year’s winner, went on to Gold Cup glory at this year’s Cheltenham Festival. Also unique to Fairyhouse is the Ladies Irish National, which ran for the first time in 2015. This is one of only two female-only chase races and both are held at Fairyhouse. Last year, Katie O’Farrell won the race aboard Flemenstorm, as part of a first career double. When does the Most Stylish Lady competition take place? On Easter Monday, the Most Stylish Lady competition is the main off-track attraction and singer-songwriter Una Healy will be head judge this year. The theme of this year’s Most Stylish Lady is Country Chic, and this year’s fantastic prize is a trip to Nashville with thanks to Dunboyne Castle Hotel & Spa. Why should I bring the family to the Fairyhouse Easter Festival? The question here should read, ‘Why shouldn’t I bring the family?’ There is something for all the family to enjoy on Easter Sunday and Easter Tuesday. Easter Sunday’s fun activities include everything from the La Bucca Easter Bonnet Competition to miniature pony displays to pony rides. Tuesday at Fairyhouse is all about creating a fun and relaxed family atmosphere, with entertainment on the day including a children’s workshop by popular artist and caricaturist Darren Birdie. Fairyhouse operates a ‘Kids Go Free’ policy at the festival. That means that anyone under the age of 16 can enjoy free access to games, bouncy castles, face painting, balloon modelling, pony rides and the front runner club. What can we expect in terms of entertainment? Away from the runners and riders, there will be live music performances throughout the festival and the marquee hosts a racing After Party on all three days. The Kilkennys will take to the stage in the marquee on both Easter Sunday and Easter Monday. You can also enjoy music in the hospitality areas, including the Bobbyjo Bistro. What else can you tell me about the Fairyhouse Easter Festival? The BoyleSports Irish Grand National is the most watched race on Irish terrestrial television. At the course itself, 25,000 punters will come through the turnstiles over the three days of the festival. The festival is worth more than €4m to the local economy, with two major local fundraisers catering for approximately 1,000 guests on Tuesday, April 23. These are in aid of the Centre for Brain Health, Mater Hospital, and Ratoath GAA and will generate significant funds for these organisations. Finally, how do I get there? There is ample on-site parking at Fairyhouse or you can leave the car at home and avail of the Easter Festival Direct Coach Service on Sunday and Monday. This return service links Fairyhouse to Dublin city centre. There is also a shuttle service to the track from Connolly station and the M3 parkway train service. You’ll find the full travel details on the Fairyhouse website. To be in with a chance of winning two Bumper Bundle tickets to the festival on Easter Monday, enter HERE. The BoyleSports Irish Grand National – The Race of the People – Make it part of your Easter Weekend. Visit the Fairyhouse website to book your tickets now.